An idyllic farm is nestled in rolling hills. A farmhouse is mostly hidden by a cluster of trees. A bounty of crops surrounds an old fashioned red barn. It’s harvest time here. Some foliage has already developed fall colors, but much of it is still a rich green. Although it’s still warm in the valley, there’s fresh snow on the tall mountains in the distance. 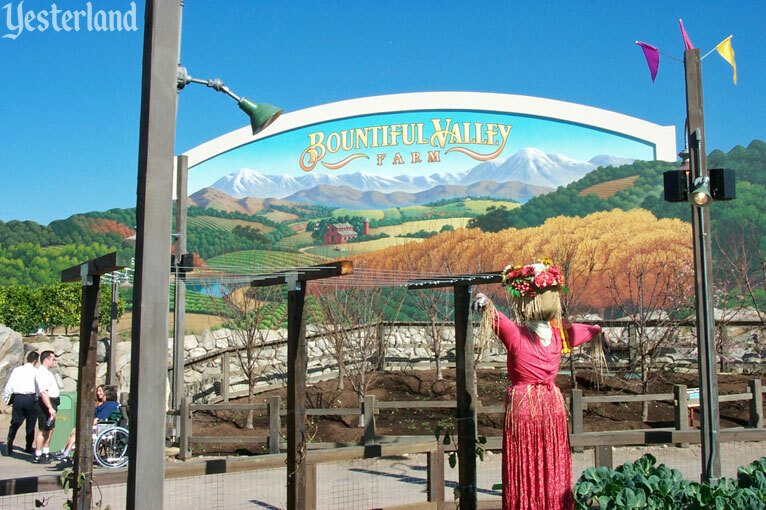 And on the sky, giant letters advertise Bountiful Valley Farm. 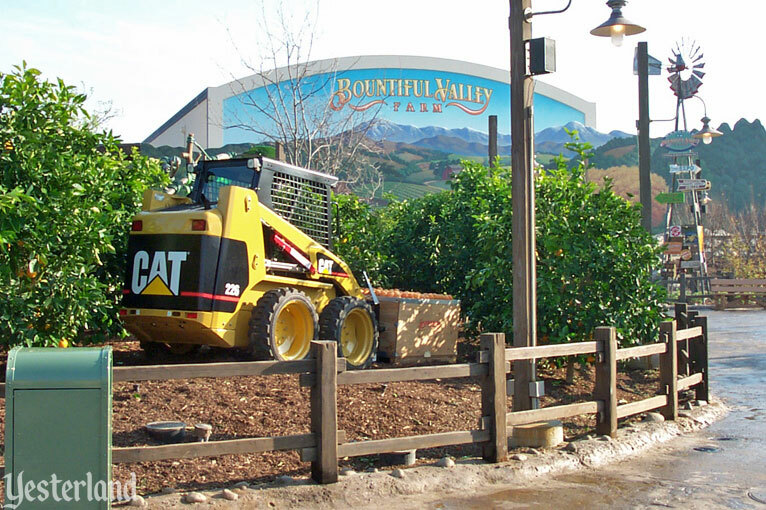 That’s where you are—Bountiful Valley Farm—an actual demonstration farm within a theme park. 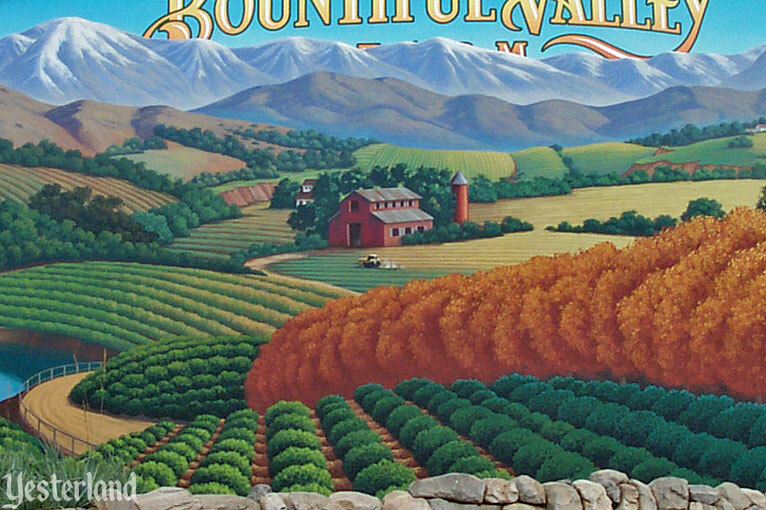 The artwork is the backdrop for the farm’s real orchards and vegetable plots. It’s not just a flat mural. There are two layers. The blue sky and giant letters are on the side of a big building with an arched roof—the Bug’s Life Theater. The painted farm scene is in front of it on a tall wall whose top follows the ridge line of the snowy mountains. Enjoy the art from different vantage points. Because of the layers, things shift around depending on where you are. The sign on the sky can even be partially hidden behind the mountains. Is that a yellow Caterpillar tractor on the field? Yes! And the tractor on the mural isn’t the only tractor around. That’s because this whole district is sponsored by Caterpillar, based in Peoria, Illinois. You have to admit the art is quite a landmark. It’s something that guests aren’t likely to forget. Wander around the farm and watch the plants grow. 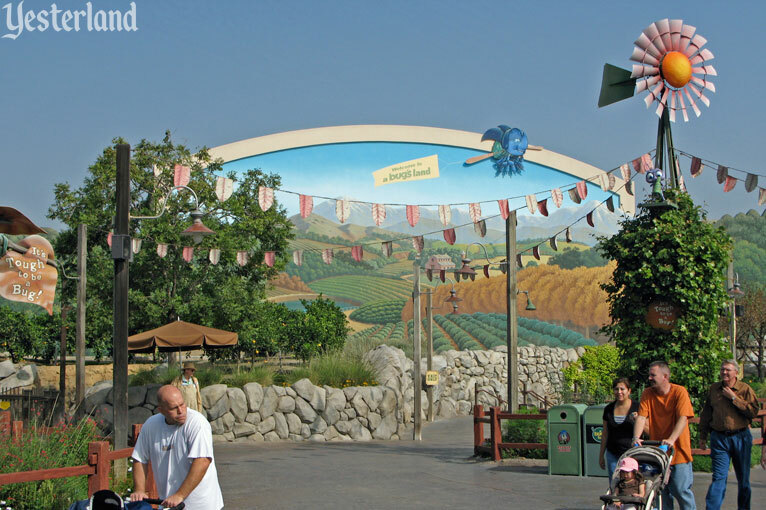 And if you forget where you are, just look up at the Bug’s Life Theater building. 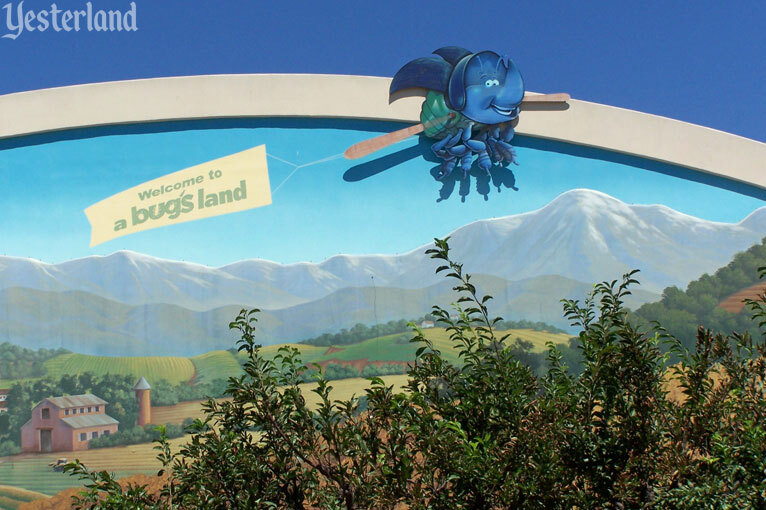 If you just imagine away the Bug’s Life Theater while you’re in the demonstration farm, you might think the foothills and mountains are real. 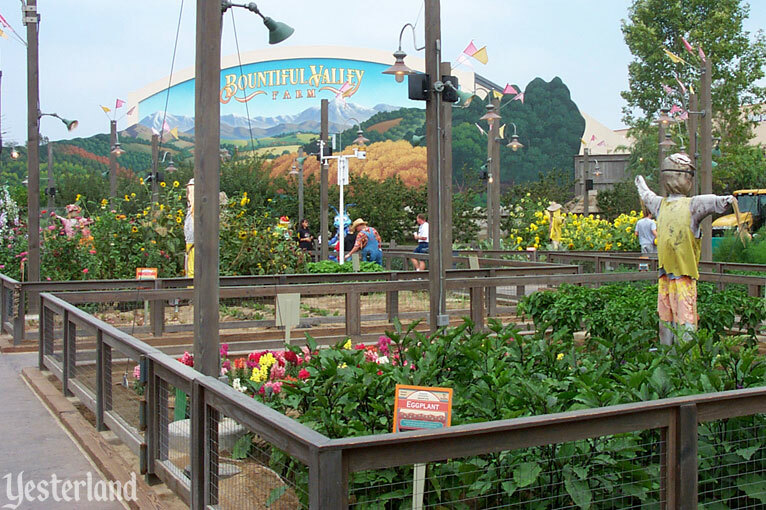 The Bountiful Valley Farm sign on the Bug’s Life Theater, home of It’s Tough to Be a Bug, was one of the original landmarks of Disney’s California Adventure when the park opened in February 2001. 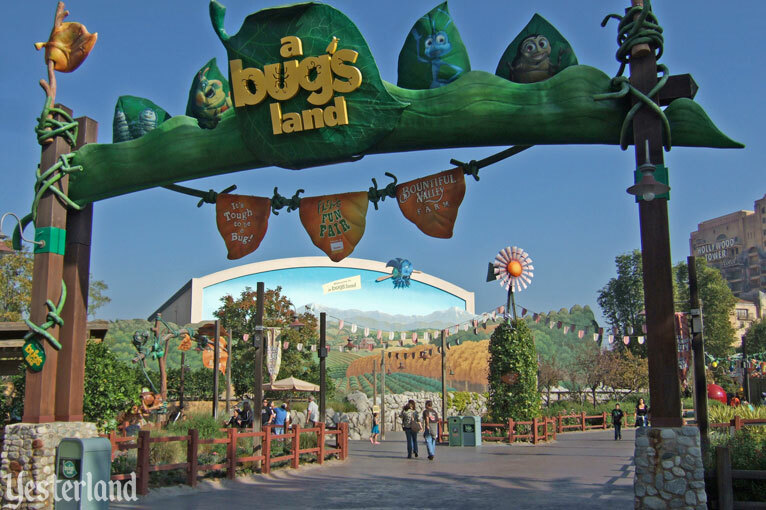 First up will be “A Bug’s Land” featuring “Flik’s Fun Fair,” an all-new playland within the Golden State area of Disney’s California Adventure. Inspired by characters and settings from the Disney-Pixar animated film A Bug’s Life, “A Bug’s Land” will encompass the existing “It’s Tough To Be A Bug” attraction and Bountiful Valley Farm presented by Caterpillar, with the addition of five new attractions in “Flik’s Fun Fair,” a specially designed environment which will offer the young and the young-at-heart a look at the world from a bug’s point of view. 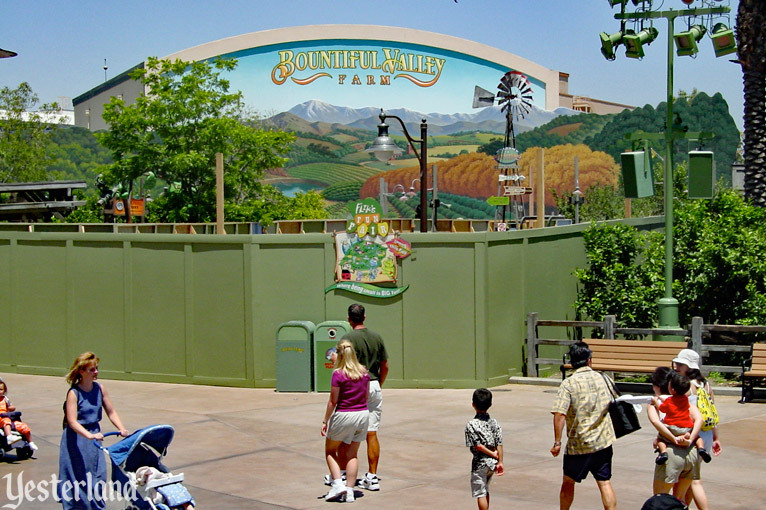 Soon a construction wall went up within Bountiful Valley Farm. 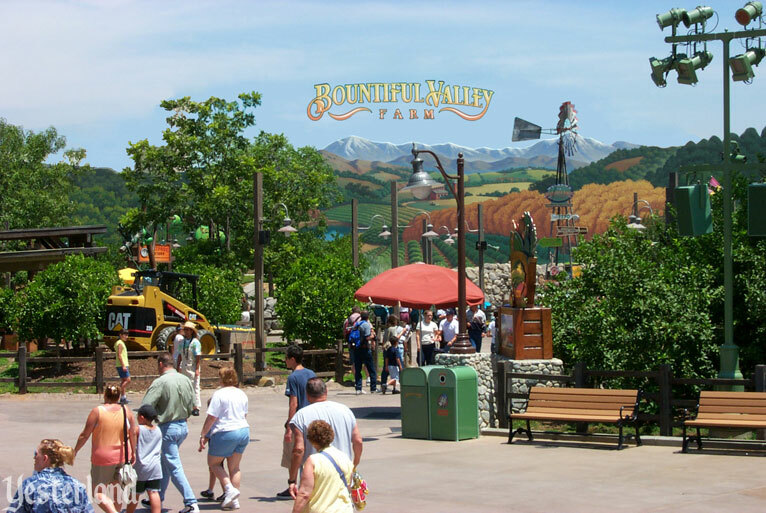 When the walls came down in October 2002, the Bountiful Valley Farm district had become A Bug’s Land, while Bountiful Valley Farm remained as an “attraction” within the new district. 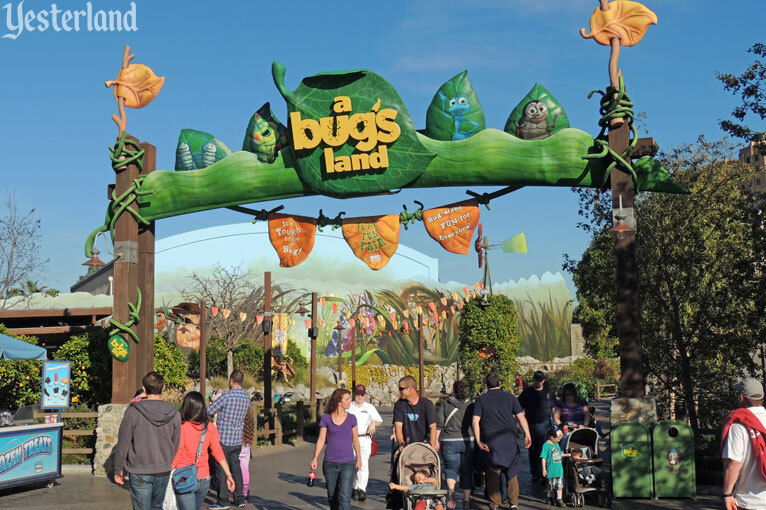 With the new branding came a new sign on the Bug’s Life Theater. The idyllic farm, foothills, and mountains remained. But the building now had Dim the blue dung beetle pulling a banner with “Welcome to a bug’s land” across the blue sky. The modified mural lasted into 2012. 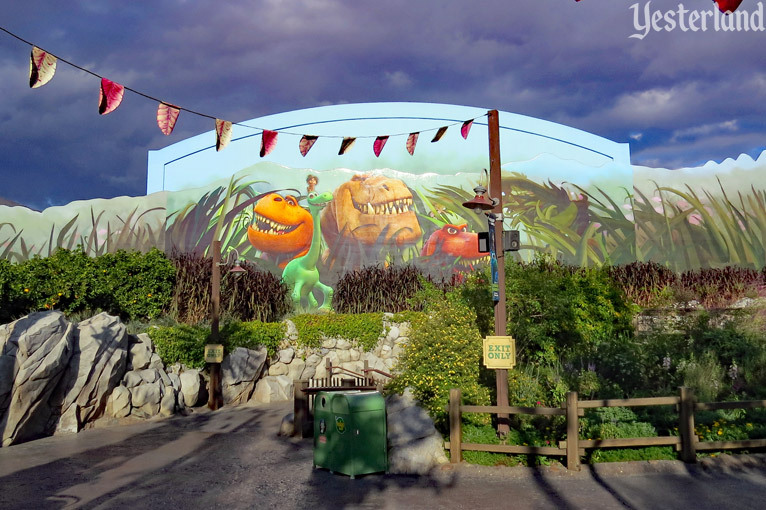 Then, behind giant tarps, both layers were repainted to be more appropriate for A Bug’s Land—especially after the remainder of Bountiful Valley Farm closed forever in September 2010. New artwork set the stage for the land that gave guests a bug’s point of view, with huge blades of grass instead of an idyllic farm. 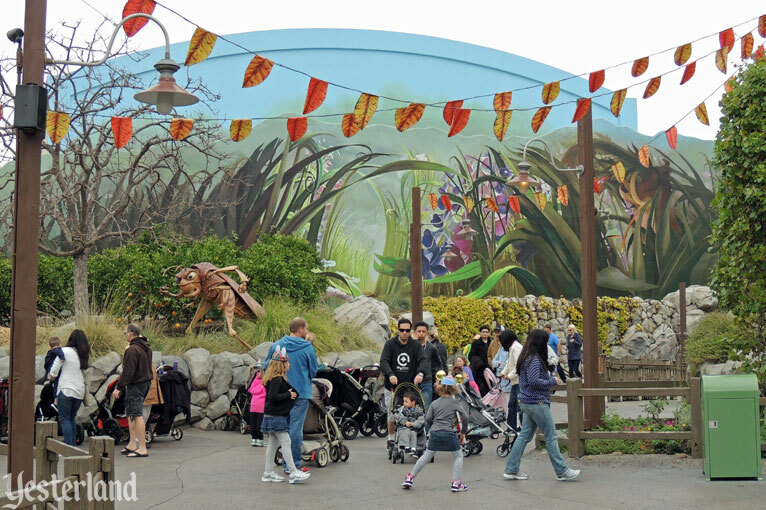 The Bug’s Life Theater was painted to fade into the background. 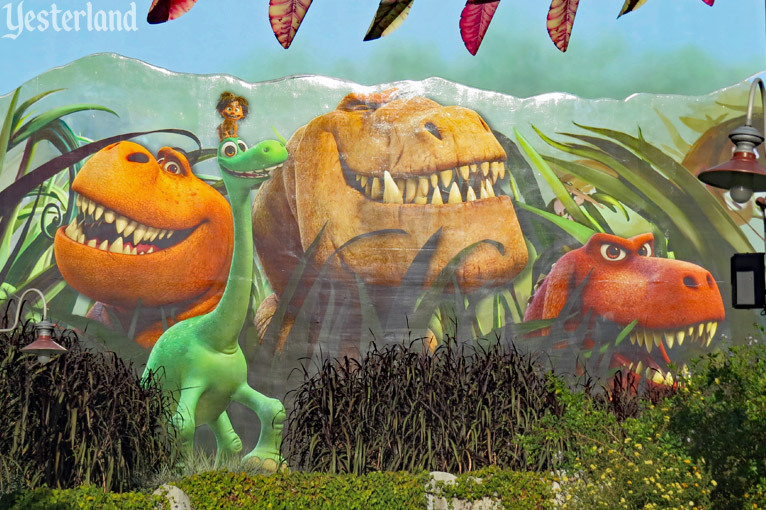 During its final years, the theater often showed “4D sneak peaks” of new Disney releases, including Cinderella (2015), The Good Dinosaur (2015), The Jungle Book (2016), and Cars 3 (2017)—instead of It’s Tough to Be a Bug. It’s Tough to Be a Bug closed permanently March 19, 2018. The next day, Disney confirmed that a new Marvel-themed land was on its way at Disney California Adventure. Guardians of the Galaxy - Mission: BREAKOUT! would no longer be an isolated Marvel attraction. 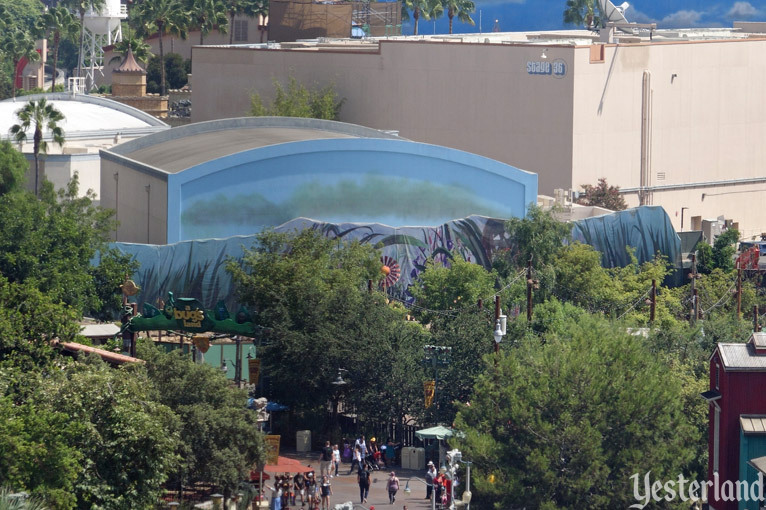 Flik’s Fun Fair closed permanently September 4, 2018, to become part of the Marvel site. 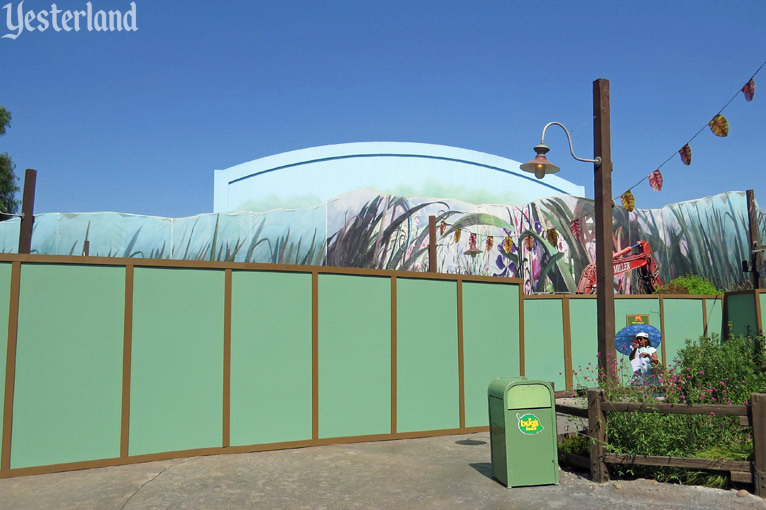 What had been A Bug’s Land would be A Construction Site for a few years. The old theater building is a perfectly good show building, so it’s likely to be repurposed. Or it could be demolished anyway. We’ll see. 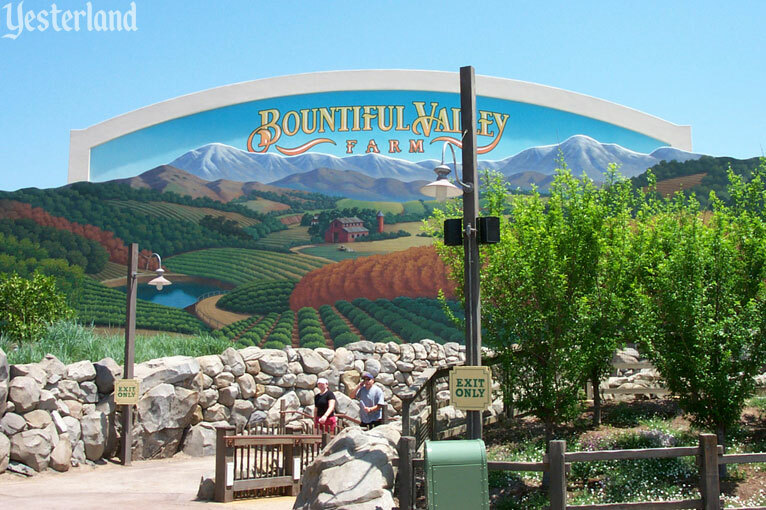 Regardless of the fate of the building, the original Bountiful Valley Farm artwork, with the huge letters painted onto the blue sky, will be just a distant memory. 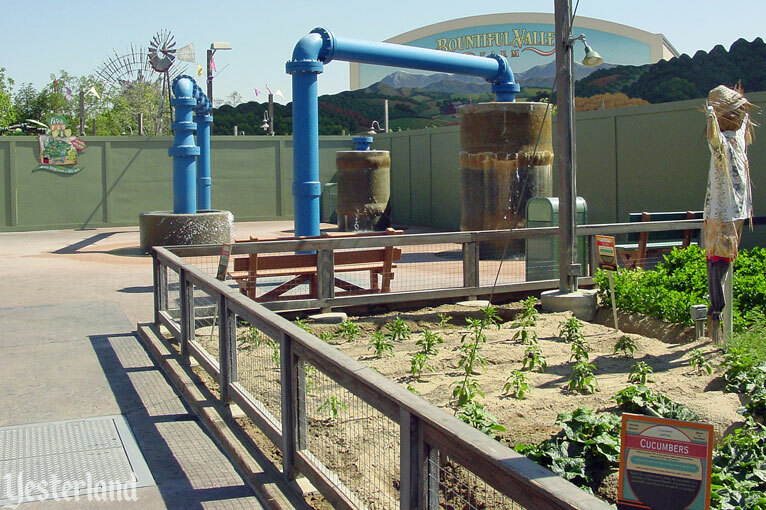 It might already be the most forgotten landmark of Disney California Adventure.